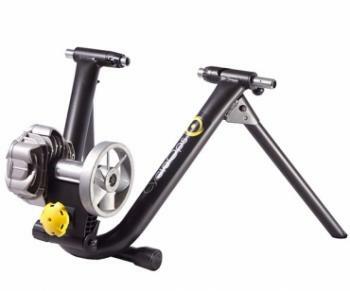 Like all fluid brake turbo trainers, the Cycleops Fluid 2 offers a progressive resistance, which means that the faster and harder you pedal the more power and resistance you feel. To keep ramping up the resistance you simply pedal harder and shift up your bikes gears as you would on the open road. The whole aim of the Fluid 2 trainer is that you feel exactly like you are riding on the road. More momentum is placed onto the rear wheel of your bike using a 2.75 lb precision–balanced flywheel that has been specially engineering to give a more realistic riding feel. Also, to make the workout even more realistic CycleOps have carefully adjusted fluid levels within the braking unit to offer a more road like workout. A lot goes into this braking technology, but simply a lot of testing on the track has led to the measurement of the position of the optimal power curve, which has been reproduced in the CycleOps Fluid 2. 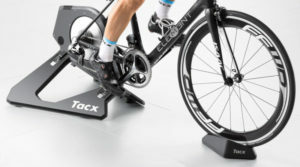 This means you get a power to pedal speed ratio that is as realistic as possible, and the resistance increases on an smooth infinite resistance curve that is based on how fast you pedal and on which gear you are in.